You know me, pretty determined about finding and using the best practices for all sorts of things... This week I'm writing about a little detail regarding attaching covers to a Coptic bound book - the hidden diagonal stitch (for the lack of a better term). 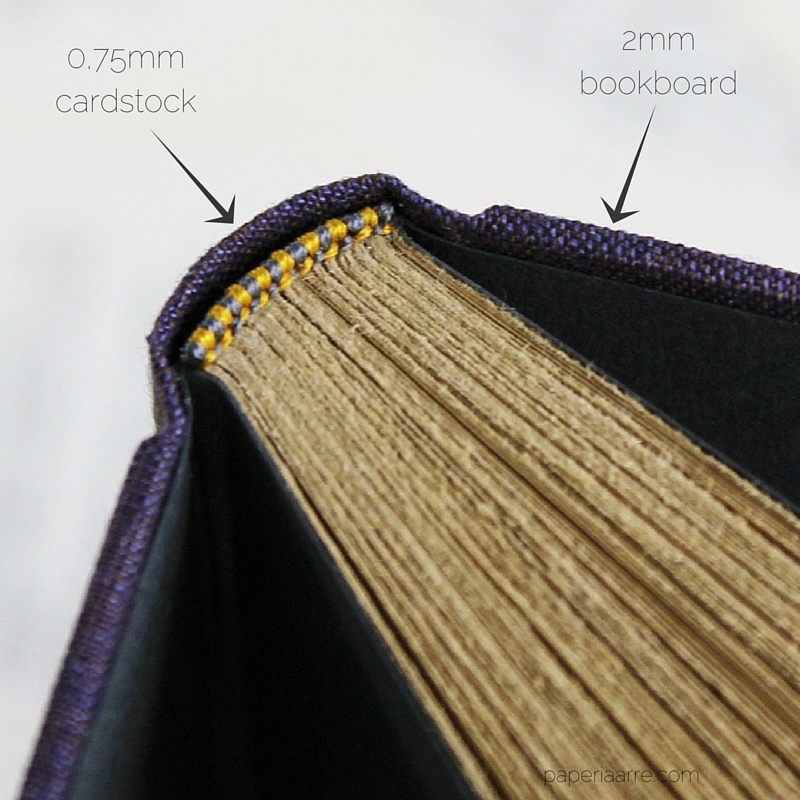 Have you noticed how the sewing thread in my Coptic bound books enters the covers at the edge of the cover board? It may seem like a very minor thing, but it's actually something quite relevant to the durability and stability of the finished book. Most modern Coptic bound books I see around the Internet have their covers attached by simply wrapping the sewing thread around the board edge. (For obvious reasons I'm not sharing photos of any particular bookbinder's work here - it's a really common practice, so you can find photos with a simple google search for Coptic binding if you don't have a clue what I'm talking about.) While that's a quicker option, it's less than ideal for durability reasons: The thread holding the covers in place is exposed at the point where a notebook goes through perhaps the most wear - at the outer edge of the spine, which is the widest point of the book thickness-wise, and most likely to stick to things when you're stuffing that notebook in your bag. Sooner or later that thread will begin to break down, and little by little the covers begin to loosen. If you want a great Coptic bound notebook that lasts longer, make sure its covers are attached at the edge of the board, not over the edge! Anchoring the covers in place with the thread travelling diagonally through the cover board protects the thread from needless wear and tear, and also diminishes the movement of the covers in relation to the pages a great deal. That's also one thing that helps to protect the thread from breaking from wear. Using this diagonal stitch does require some thickness to the cover boards for it to work. Depending on your thread thickness, you can probably get away with using 2mm board. I prefer 3mm minimum, but that's just me and my aesthetics. I shared this little video on Instagram showing how I create that diagonal channel for the thread to travel from the spine edge of the board to the first hole going directly through the cover board. And here's a peek of the double needle Coptic binding tutorial I made for Making Mini Books by Kathleen McCafferty (Lark Crafts, 2011). This illustration should explain much clearer the path for the sewing thread in the covers than my words ever could. I definitely recommend getting acquainted with the book - it has plenty of great mini book tutorials! And they're all made using techniques that are easy to adapt to larger scale notebooks, too. Remember the tip I shared about creating neat holes? These holes were drilled using Dremel, and while that's neater than using an awl (also easier on my wrists), some tidying up is still required before covering. Creating those diagonal holes is less bumpy, so that's the one hole I always make after the covers are all done and ready to be sewn in place. Structurally I find more sewing stations = better book. Unless you go really extreme, that is. Sadly, with multi-needle Coptic binding doubling the number of sewing stations also means the time spent on sewing doubles. 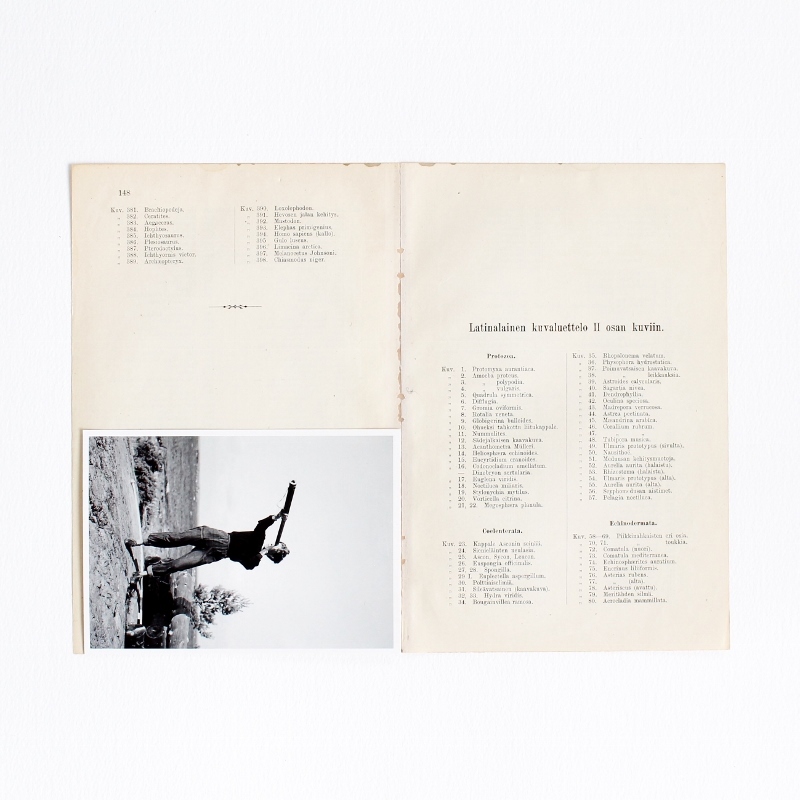 Still, I think stability is crucial, and I'm happy to spend that extra time to create a more durable book. I'd only use two sewing stations if the book is max 3 inches tall. Any non-miniature book should have at least four sewing stations, but more=better, obviously keeping in mind the size of the book. As a side note I want to mention that the terminology of bookbinding seems to vary a lot from source to source. I (and most others) refer to this type of binding as the Coptic binding, while some think it's an Ethiopian binding - the difference between the two being either the style and/or lack of endbands and/or the style in which the covers are attached. I haven't found a reliable definition that would make the difference clear. So, for now I'm still sticking with the term Coptic. If you have special knowledge about this terminology, I'd love to hear more about it! PS. This tall but skinny book has plenty of pages made from thick drawing paper, and it's available for sale in my shop. The Internet is full of different types of bookbinding tutorials - some more detailed than others, some written by bookbinders and some by enthusiastic hobbyist. What they usually have in common that they still focus on giving out instructions for one specific project. 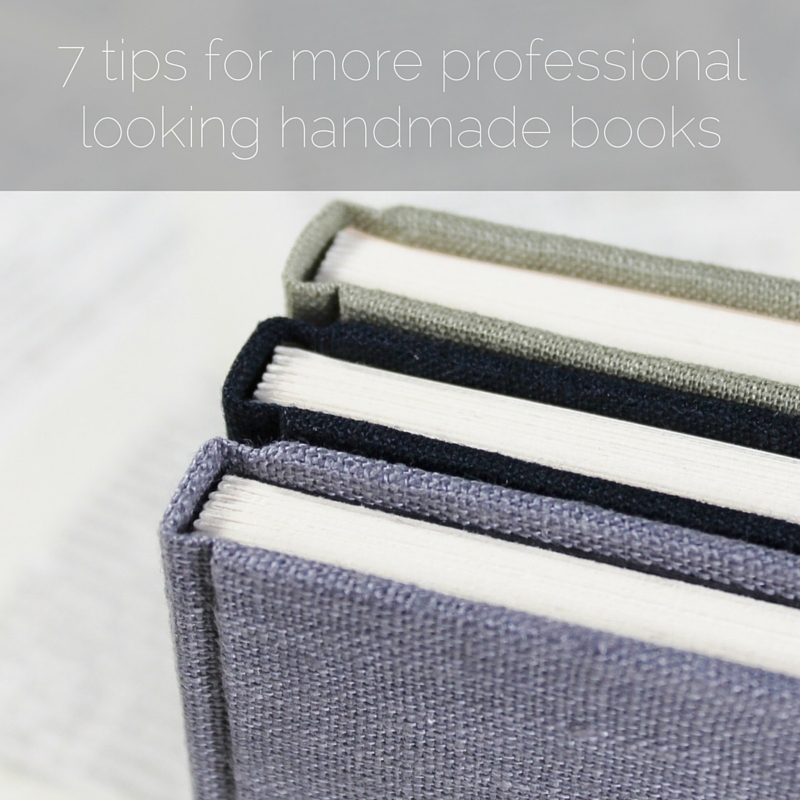 Today I hope to give you a few very basic tips you can apply to many different types of bookbinding projects and create more professional books yourself. Some of my tips are very detail oriented, but details are crucial to creating a balanced whole. The title promised you seven tips, but you get some sidetrack extras, too. As I began planning this blog post it also came to me that I could do a Q&A / Office Hours on Instagram every once in a while. 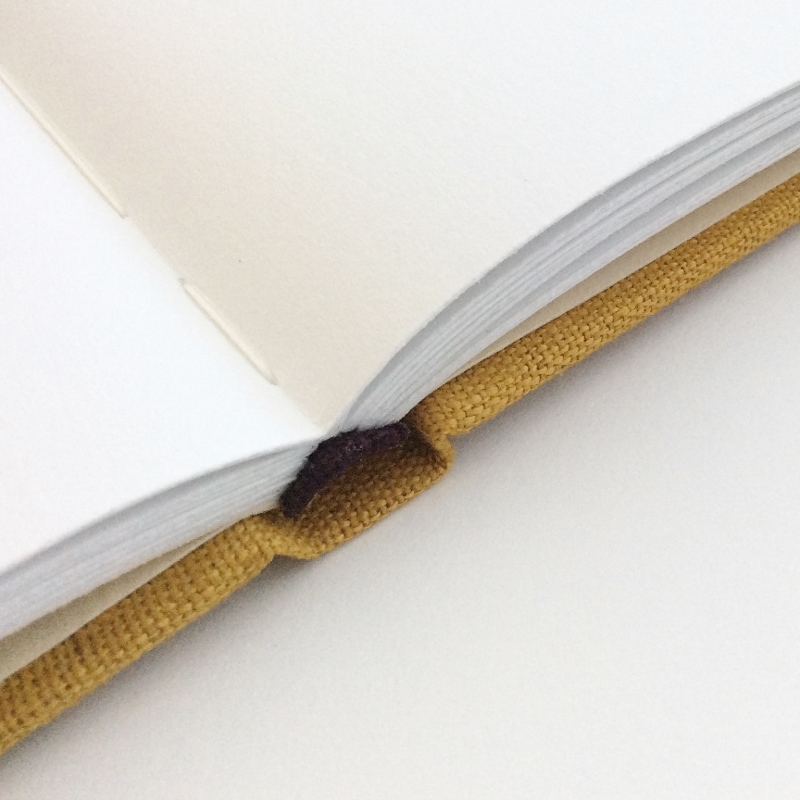 In the comments you could ask me questions about bookbinding, tips on what you could focus on next on your own bookbinding journey, or whatever questions you may have about me or my work. Let me know if you like the idea and I'll set something up! Now, on to the tips! Do not ever think you can get away with using paper or board with the grain direction not running parallel with the spine. Even paper-backed book cloth has a grain direction you should take into account. (The worst place for a wrong grain direction is in the endpapers of a case bound book. It will be ugly, trust me.) 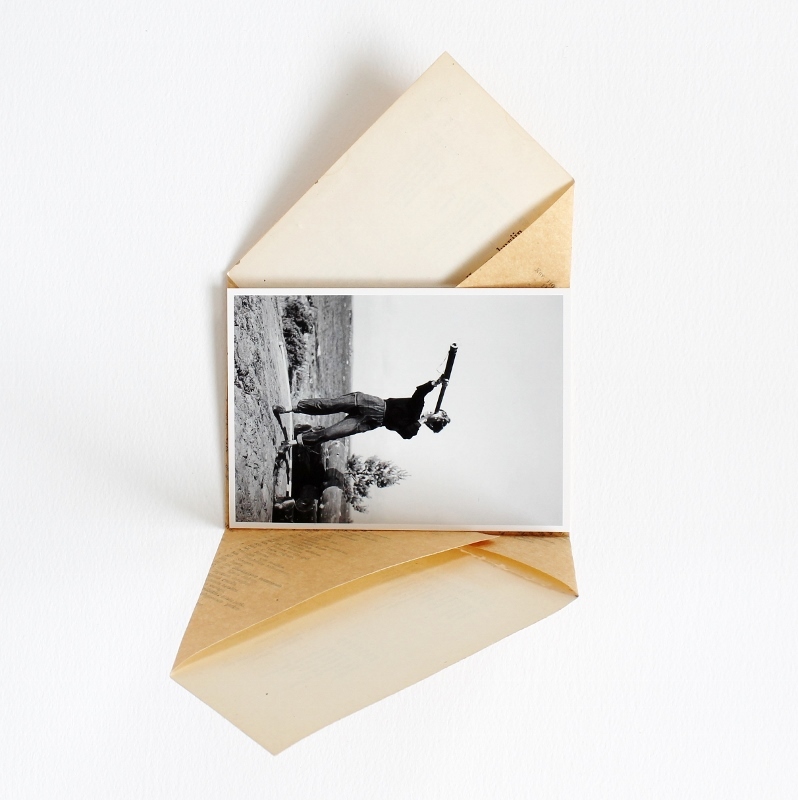 Grain direction is the foundation of bookbinding, and its importance can never be brought up too much. Overworking will result in a book that looks overworked, it's that simple. A while ago I had a chat with my hairdresser, who is endlessly blown away by crafty people despite being super talented with scissors and hair herself. She complained how all her origami turned out looking terrible regardless of her following each step to a T. I instantly asked whether or not she carefully went over each fold and creased them sharp over and over again. Of course she did! But that's the problem! Sharpening a crease several times can begin to stretch the paper fibres away from one another, and the end result won't look as good as it would if each fold was done well the first time and then left alone. This principle goes for every step of bookbinding, too (and of probably every other craft). Do it well the first time and move on.Paying excessive attention to any area will only result in that area looking overworked once finished. Usually the area you want to keep working on is a problem area, and that's definitely not the area you want to be the focal point of the finished book! So, if it's not outright disastrous, just let it be. And next time, do it better on the first try. If you glue large surfaces using a tiny brush, there's a chance you'll end up with that overworked look. Also, your glue begins to dry where you began before you've finished glueing the rest. Using a brush that's too large on small details will result in too much glue (who would've guessed that?). Too much glue means soaking wet materials and glue in all the wrong places. It's a good idea to keep at least two sizes of glue brushes at hand any given time. I also have two glue jars - one for sticky glue, one for easy to spread glue. I have big glue pot from which I fill my smaller container, as I don't want to keep that big pot open whilst glueing for long periods of time. It would just dry out for no good reason. If I'm glueing larger surfaces I use slightly thinned down glue, but I like to use that thicker, stickier glue for assembling boxes or sticking down small details without wasting too much time waiting for the glue to dry afterwards. Eventually my sticky glue jar will get too sticky, or just dry out (there's never much in it anyway), but by that time the jar with what's left of the thinner glue will have thickened up enough to become the new sticky jar, and I can replace the old dried out glue with fresh thinned glue. Constant cycle of glue jars. Not sure how professional this approach to glue is, but it works great for me! I use Planatol BB bookbinding glue, but most PVA glues behave the same way. 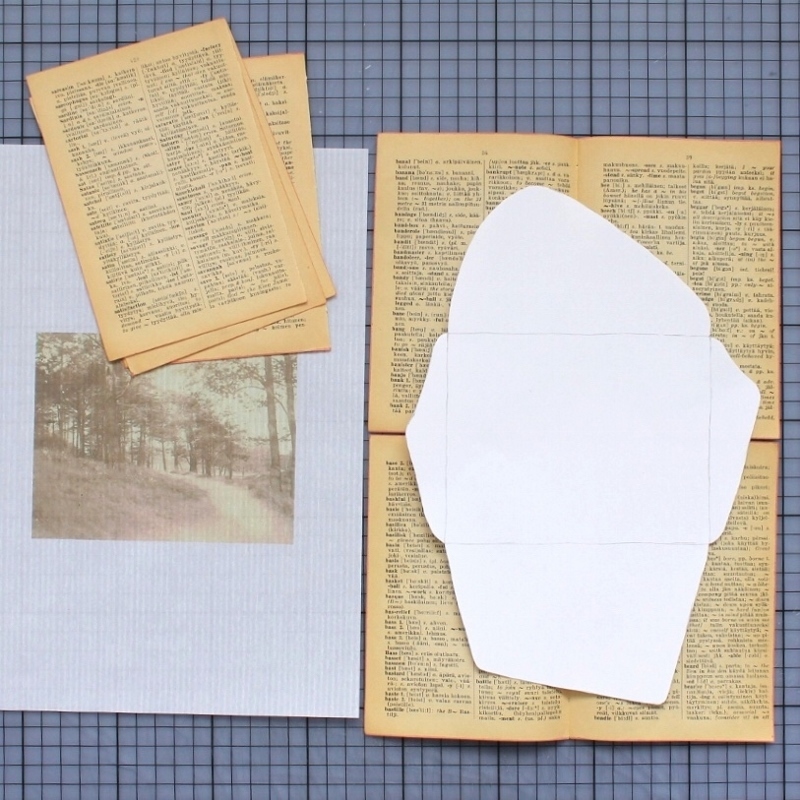 Do you fold your pages in half individually? Do you press down each fold with your bonefolder as you go? Don't. It's not the best way to go about folding signatures. If you're bold enough (or plan to trim the edges of your book after sewing and getting super neat edges at this stage is irrelevant), fold all sheets in a signature at once. This way the sheets mold around one another, the fold becomes a more solid whole, and the paper fibres go through the least possible amount of stress. If you fold your pages one at a time and make those folds really crisp the sheets can't snuggle up as closely at the fold. If folding several sheets of paper at once is a terrifying thought, you can still fold them individually - just do it very lightly, gather the sheets into signatures, and only then press down those folds firmly with your trusty bonefolder. I did that fancy drawing above just for you. I wanted to show you how the sheets snuggle up. Sorry, my drawing skills aren't quite up to par with my books. For a more professional looking case bound book make sure to use lighter cardstock for your spine strip. The board you use for the covers is much too thick for the spine, but it's something I see a lot when perusing Pinterest and Instagram. Using the same board for the spine and covers throws off the visual balance. 0,5-1mm is the range of thicknesses I usually consider decent spine material. You can even cut up an empty cereal box to be used for spines, so having suitable thickness cardstock readily available shouldn't be a problem for anyone (You don't eat cereal, you say [me neither!] - then use some other lightweight box material.). The spines on my books aren't cut from boxes, though, I usually order big sheets of board in different thicknesses from Modulor. I love Modulor, they're great. And I didn't get compensated for saying so. Squares? You know how case bound books almost always have their covers slightly larger than the pages? That little ledge of covers extending beyond the book block is called the square. 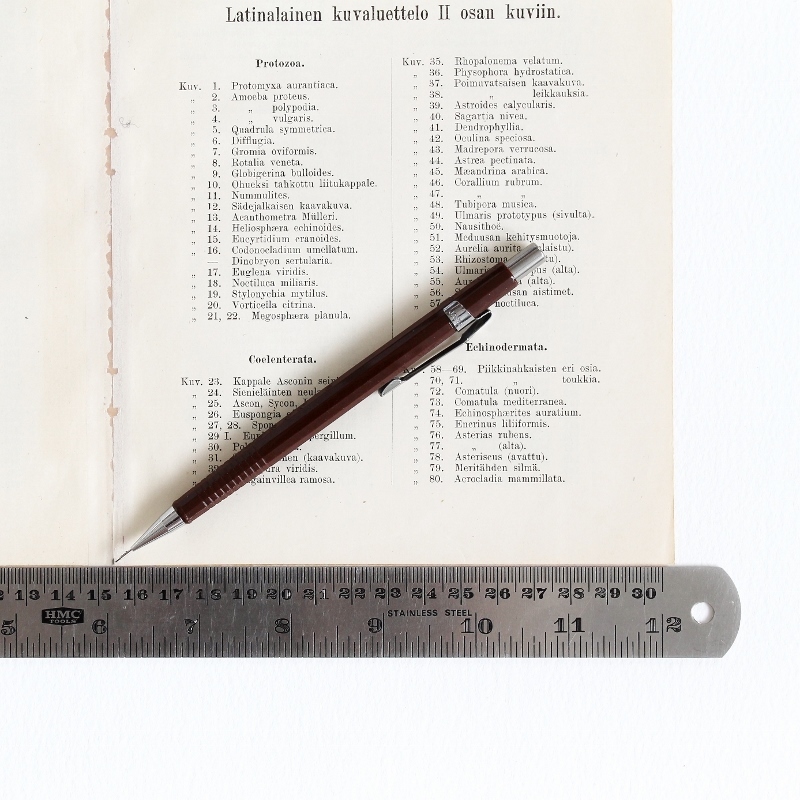 Ideally your fore edge square is slightly wide than the top and bottom square (which should be the same). 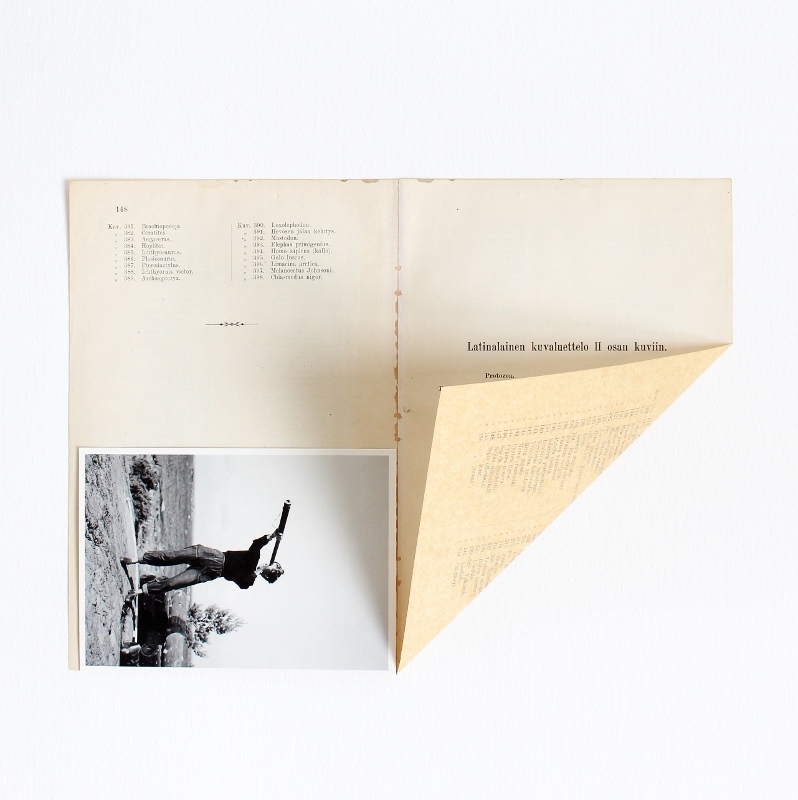 Half a millimetre can be enough to make a book aesthetically more pleasing and balanced. This is a tiny detail, but hey, professional looking books are made with great attention to detail! Proportions are very important. The width of nice looking squares (and the thickness of cover boards) depends on the size of the book, so try to keep that in mind. 2mm at the top and bottom edge + 2,5-3mm fore edge square is great for a smallish book, but it would be way too little for a large family Bible. As a bookbinding student I learned there's only one correct order to do turn-ins on a book cover, and I still follow that order with no exceptions. Head and tail turn-ins are done first regardless of the shape of the book; short and long sides play no role here. 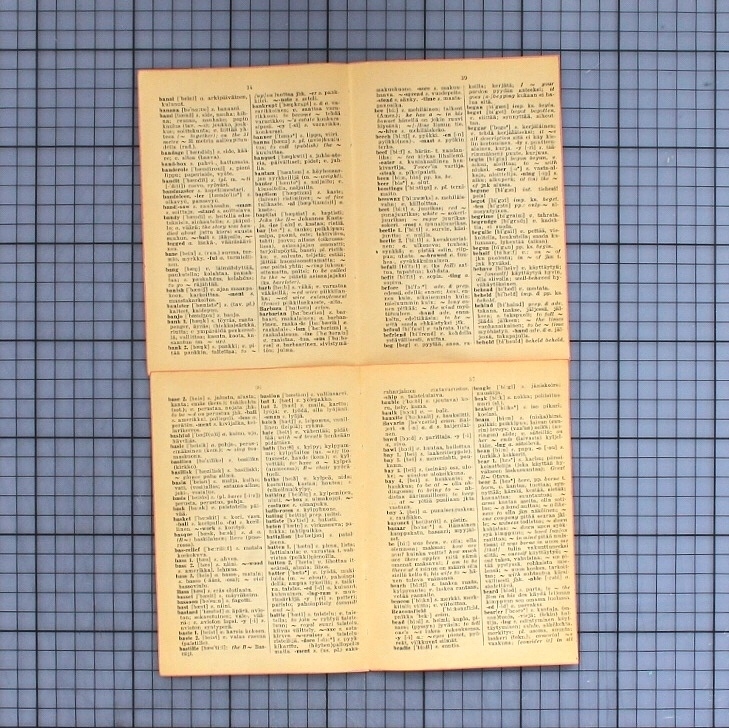 The fore edges are done last, so the topmost turn-in edge at the corners ends up facing away from the fore edge. There's a reasoning behind this logic - the fore edge of the book is the edge that is handled the most, so it must also be the most finished one. Restless fingers could easily begin undoing the corner turn-ins while reading without even noticing if the cover materials laid there the opposite way. Many bookbinding structures require you to punch holes into your cover material - either on the covers like in Coptic bound books, or on the spine strip like in long stitch bindings. If you aren't used to using a hole punch (one that actually removes material) instead of piercing the board with an awl or a needle, you're surely familiar with that lump of excess material forming on the reverse side. Do take the time to get rid of it. It's extra work, but doing it makes your holes so much neater. I always, always punch holes before covering the boards. I punch them from outside in and shave off the extra material with a small knife. Then I proceed to attach the covering material onto the right side and lightly prick through the holes still visible on the board reverse. I flip the cover over and use my awl to fully pierce the cover material where the prick marks are. If the reverse side is also covered before stitching, I repeat that light prick + awl piercing from the opposite direction. By doing this I make sure that the excess material from punching the covering materials ends up hidden in the punched hole, instead of creating a visible burr on the outside. This may seem like a really complicated series of steps, but it really isn't once you get the hang of it. I always get compliments how neat the stitching on my long stitch bindings is, and this is really the biggest secret behind it (the other one is creating good punching templates). That's all for now. I hope you found this post useful! Maybe I'll share more practical tips at the Q&A session, if enough people are interested for it to make sense for me to set one up! Q&A sessions would make more sense than answering individual questions privately as they come, because that way other people could also benefit from the questions you asked. After my first envelope tutorial I got requests for another one on how to make a folded envelope, and this is it! For my envelopes I used old book pages fused with tissue paper using the technique explained in my previous mixed paper envelope tutorial, but you can use pretty much whatever paper you have on hand as long as it folds with ease. 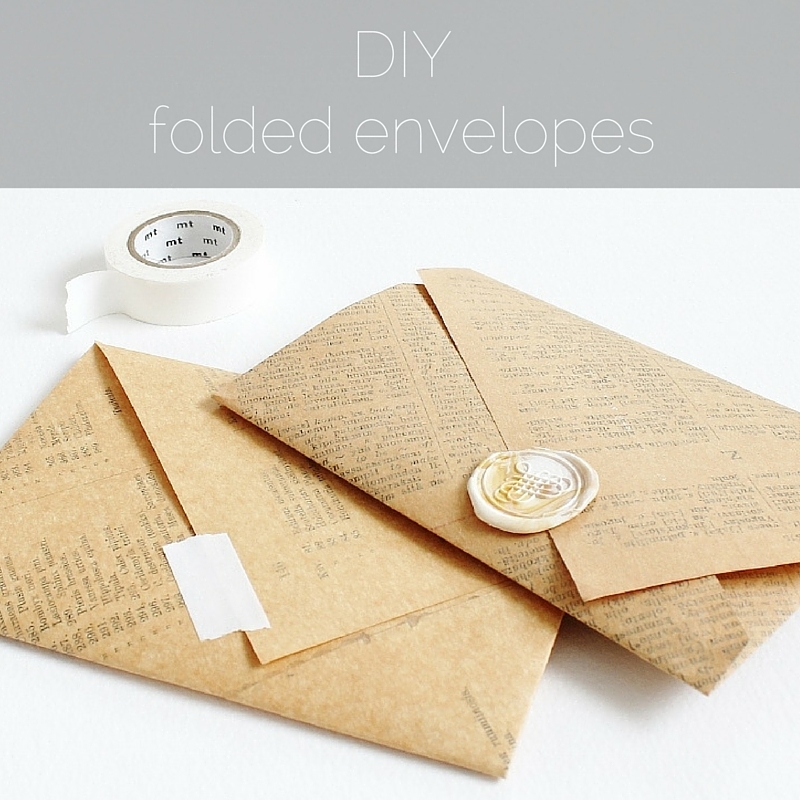 This envelope style is super simple, but it lends itself to many variations. 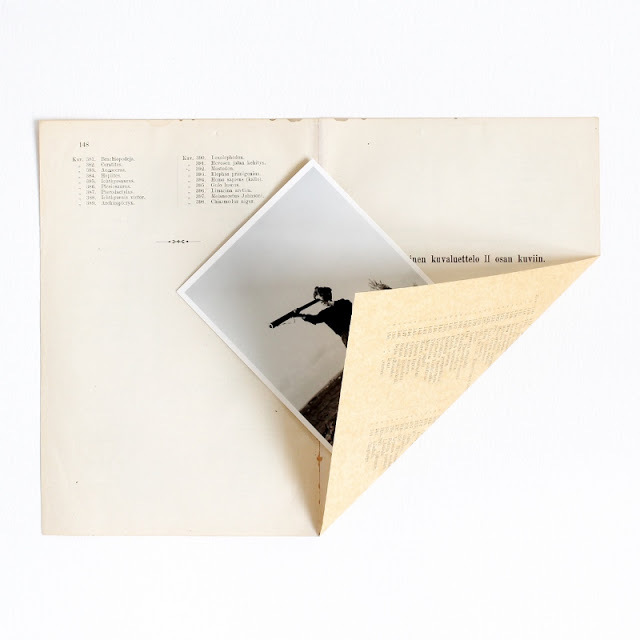 I often make a test version (or five) using waste paper if I'm working with a non-standard size or different angles and I have something very specific in mind. The wrapper of our wedding invitation was folded from a fairly long rectangle, and I have to say it took me a while to figure out the measurements for it. 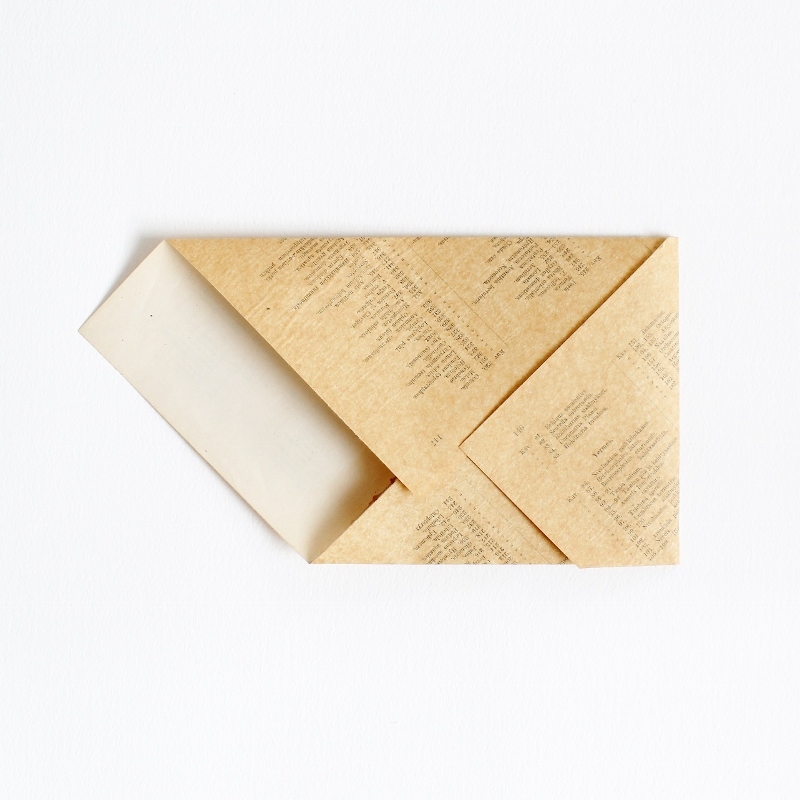 For a painless first try at making a folded envelope, stick to standard size paper, but after that - just go and experiment to your heart's content! 1. Mark lengthwise centre point. If the paper you're using has a right side and a wrong side, make the mark on the wrong side. 2. Place the postcard along the long edge right next to the centre point mark. This will serve as a straight edge and help you fold a neat 45 degree fold. 4. 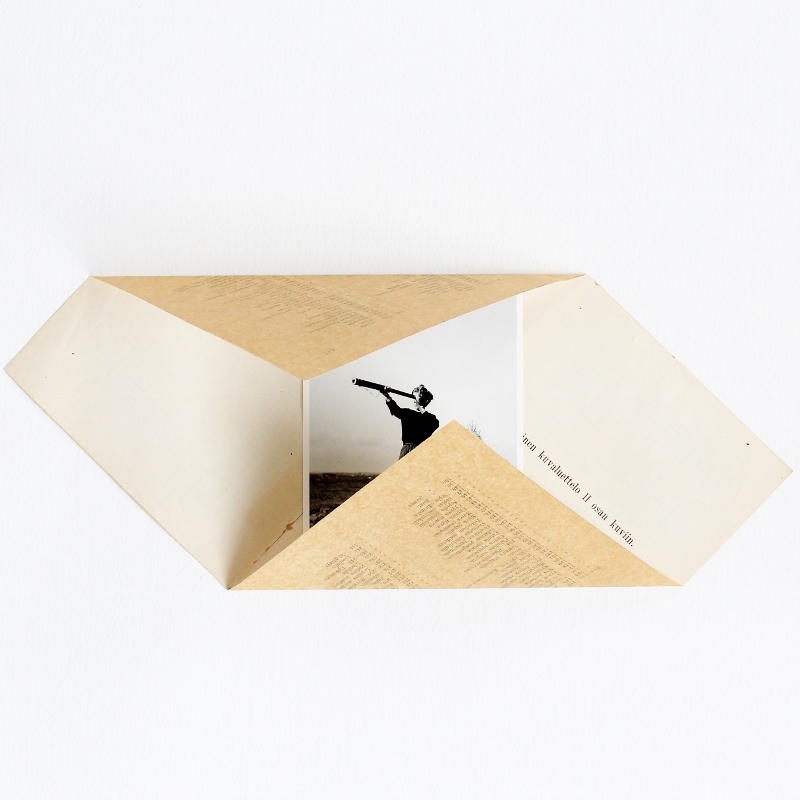 Place your postcard inside the fold. 5. Fold the opposite corner down along the top edge of your postcard. This way you ensure your envelope matches the size of your postcard perfectly. You can now set the postcard aside for the next step. 6. Fold one flap. In my example envelope this will be the topmost flap of the finished envelope. You'll want to make the fold at least 5 millimetres away from where the shorter side flap fold ends. This gives the flaps a good overlap. 7. Unfold the last flap fold and place your postcard against the fold as pictured. Fold the opposite flap along the edge of your postcard. 9. Open all folds and put your postcard / letter inside. 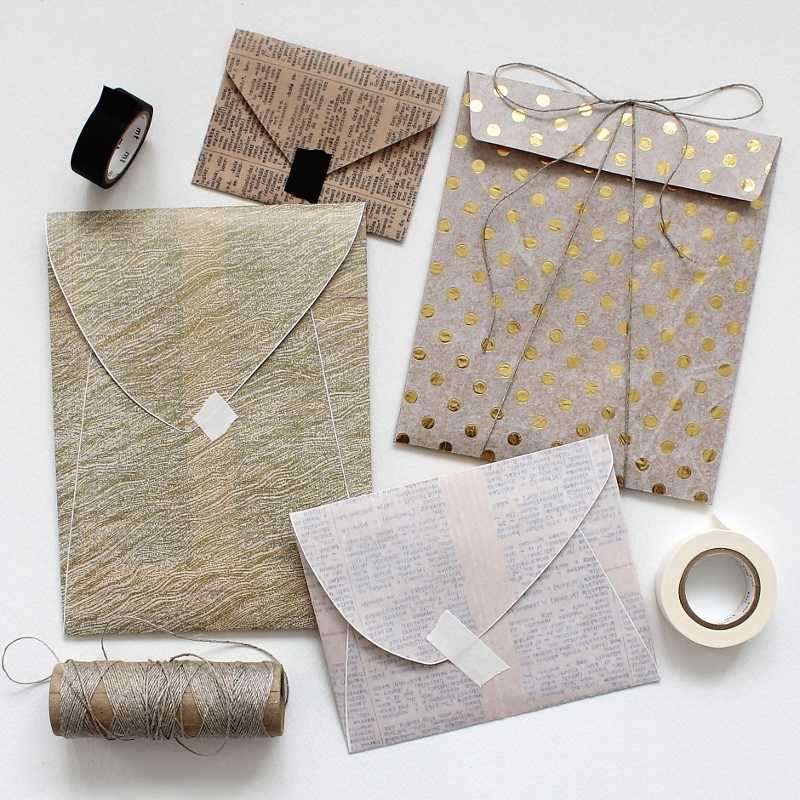 Fold in flaps and seal with a bit of washi tape. PS. If you run into issues creating your envelope, or if you feel this tutorial needs some clarifying, leave a comment or write me an email letting me know what steps you found problematic, and I'll get even more detailed! PPS. The lovely lady featured in my postcards is none other than the multitalented Tove Jansson, perhaps best known as the creator of the Moomins. We're getting crafty today! 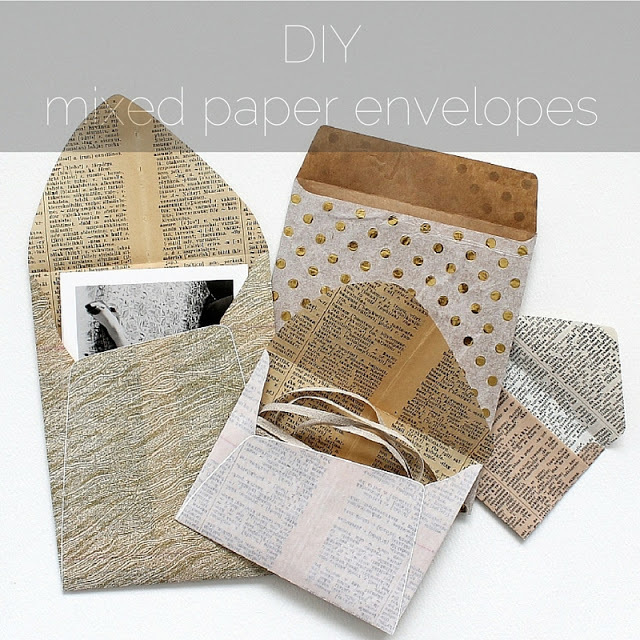 I wrote you a tutorial on how to make a mixed paper envelope with asymmetrical flaps. This is a bit of a two-in-one tutorial: I'm showing how to design your own custom sized envelope from scratch AND I'm sharing a technique for fusing together mixed papers for one of a kind craft materials with endless possibilities for variation. Nothing prevents you from using either part of this tutorial independently, but this envelope project is a pretty sweet one, so you should definitely try it out! Two envelopes made with photos printed on vellum paper, lined with dictionary pages. 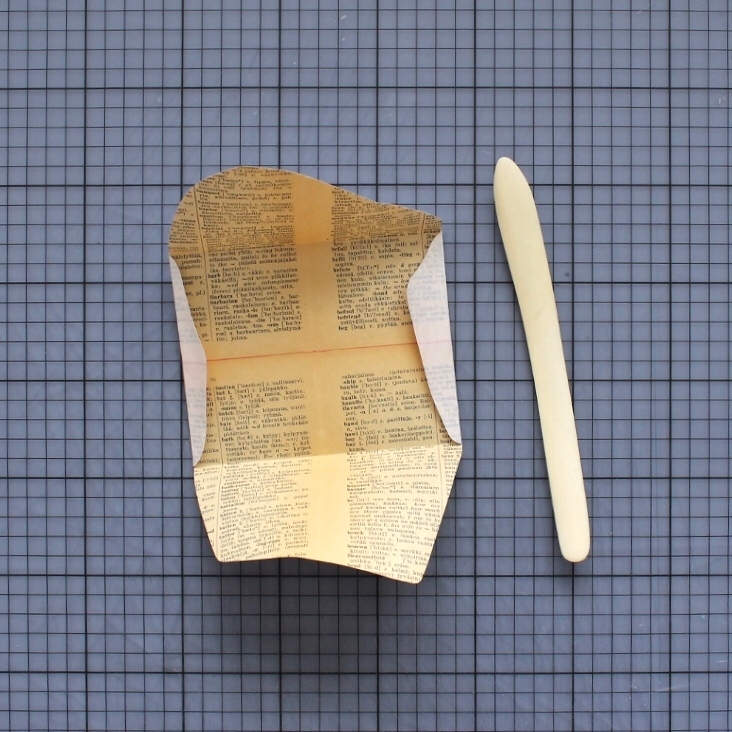 Two envelopes made with decorative tissue paper, lined with dictionary pages and kraft paper. 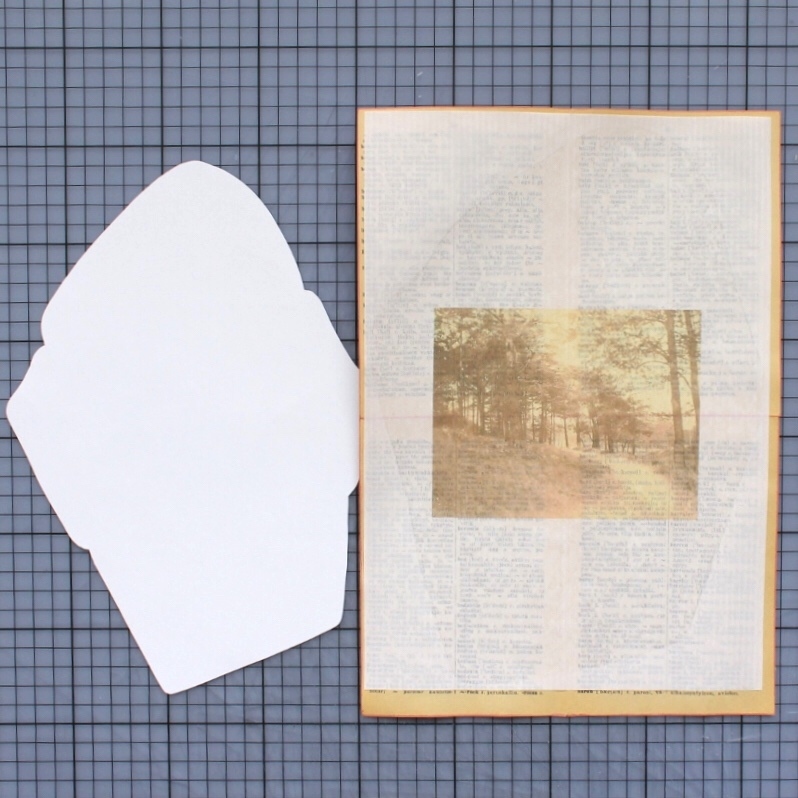 The variations are endless, really: you can use translucent papers (vellum or tissue, for example), patterned papers, brightly colored papers, recycled papers (magazines, newspapers), fabric etc. 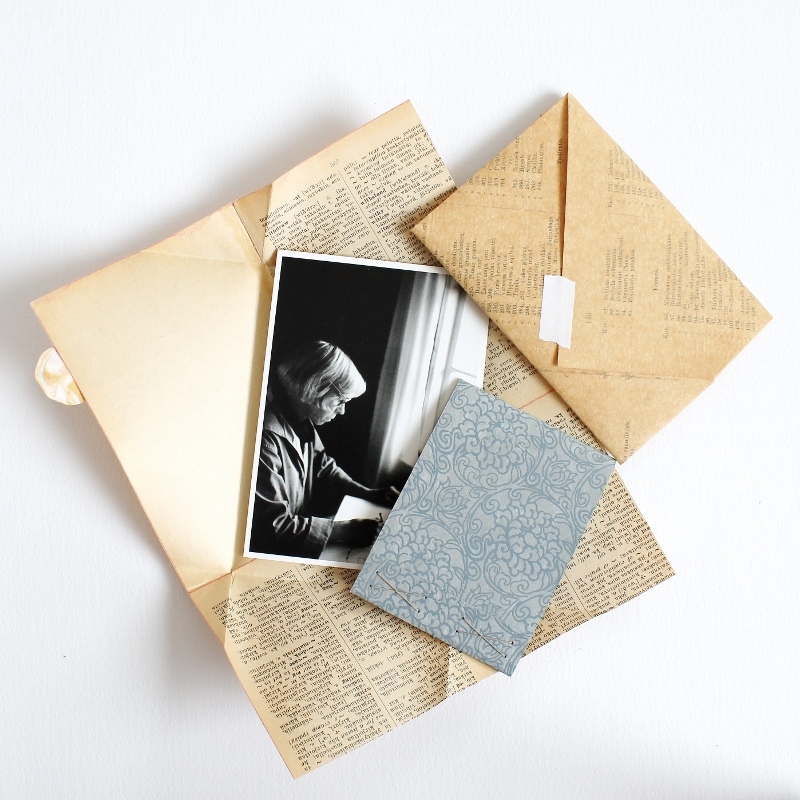 Furthermore, by fusing together different materials, you end up with two different sides to choose from - a printed photo would be lovely on the inside, as a liner, just as well. 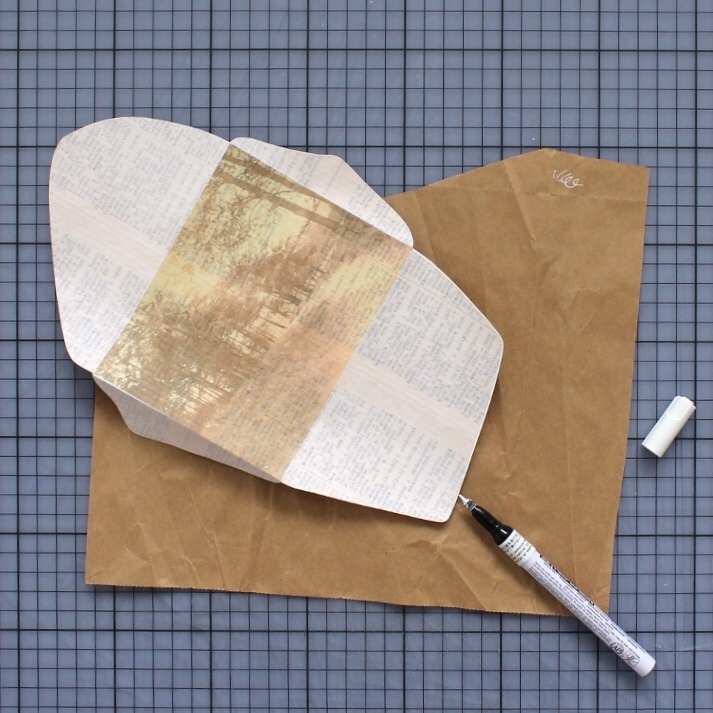 The technique I teach you in the following tutorial allows you to make an envelope using pretty papers that would be too fragile to be used alone. 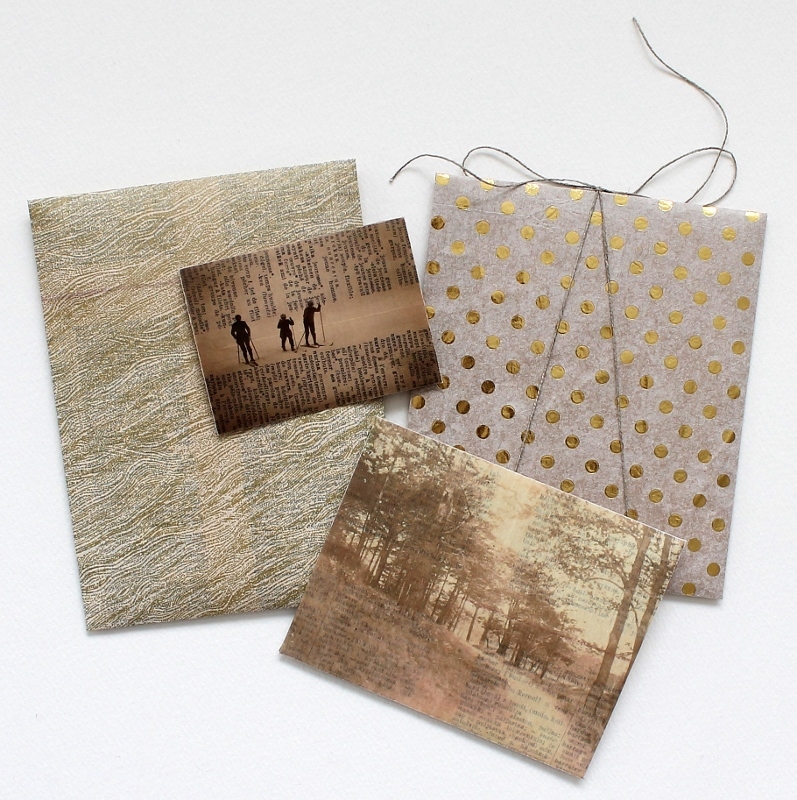 Heavy weight papers and cardstocks, however, are not ideal for fusing as they will get quite bulky. If you have a gorgeous thick paper you'd like to use, you can skip the fusing part of this tutorial and use the paper on its own. Designing your own envelope template is fun, and by making things from scratch you are limited only by your imagination. 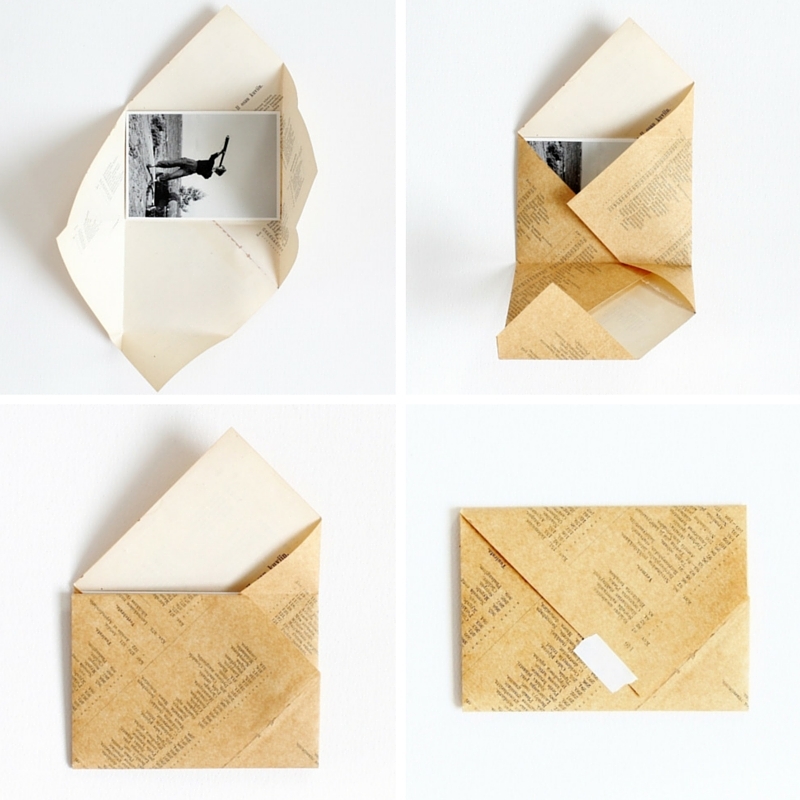 Your flaps can take any shape you want - this gorgeous envelope on Pinterest inspired this project! Unfortunately, I was unable to find a source for the photo even with reverse image search. After getting comfortable with the template design process you can even abandon the traditional rectangular shape and go for triangles, or hexagons, etc. I've heard that in some countries irregular types of envelopes cost more to mail, so you may want to look into your country's regulations before cranking out dozens of triangular envelopes. But for envelopes traveling from hand to hand, you can let go of all the limitations you thought you had before. The top envelopes were made using traditional envelope templates. For the two bottom ones I drew my own asymmetrical templates. For those I also added a white decorative edge using an opaque white marker. I know this tutorial is terribly long, and honestly, making envelopes doesn't have to be this complicated. Sometimes you just want to make a very special envelope. That's the occasion this tutorial is for! Not feeling confident about your crafting skills? Try a simplified version: 1. Skip making your own template. Take any envelope you have at hand and take it carefully apart. Use this envelope as your template. Or do an online search for envelope template and you'll find tons of templates to choose from. 2. Skip adhering layers of paper together. 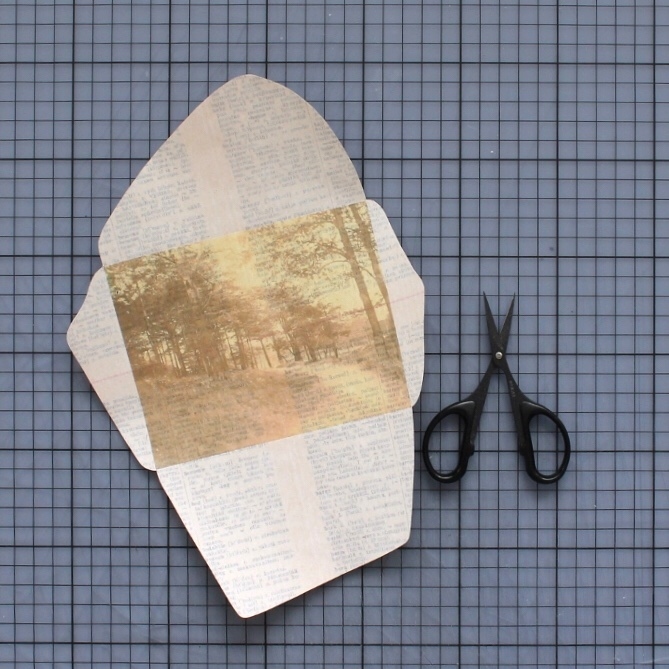 Pick just one pretty paper with some body, instead of sticking thinner papers together. Continue from step 14. Read through the tutorial before you begin and make sure you have the necessary materials and tools. Also, please remember the end result of following this tutorial, more or less carefully, will not in any way reflect your value as a human being. Everyone who plays along gets a big virtual hug from me. Now, it's time to get creative! 1. If you feel like using a photo on your envelope, pick one. The size of paper your printer can handle does affect how big of an envelope you can make, so if you need a big envelope, skip the photo and pick something like a pretty tissue paper instead. 2. Copy and paste your chosen photo onto a new file on whatever program you use for your basic word processing needs. Determine what size of an envelope you need and resize the photo to match those measurements, cropping if necessary. If you want to address the envelope, you can add text to the photo at this stage! 3. 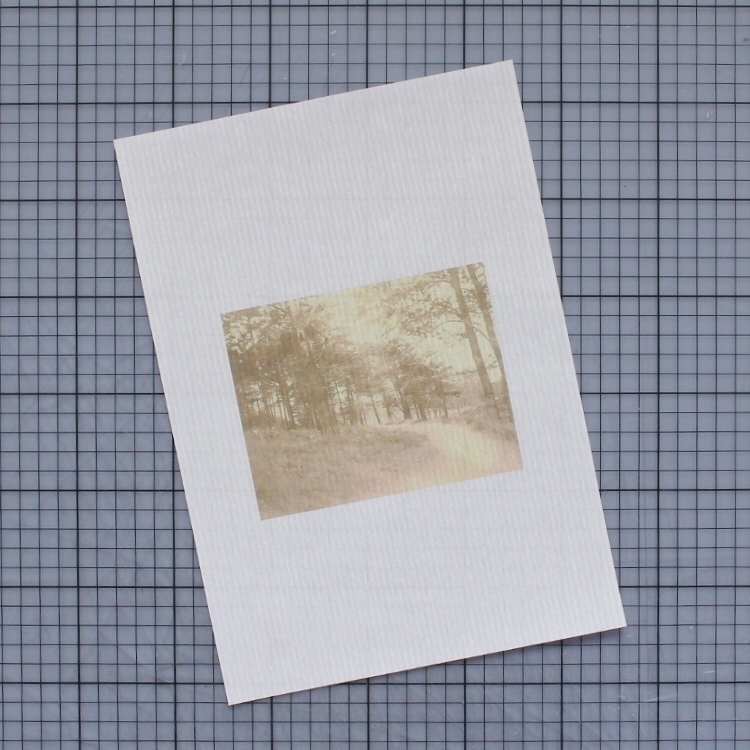 Position the photo so there's room for creating all four envelope flaps around it and print it onto the vellum paper. I recommend using an inkjet printer as the ink laser printers use may not like being ironed later on. 4. Time to draw a template! Place a sheet of paper on top of your printed vellum paper and trace the outline of your photo (or if you're not using one, just draw a rectangle the size you want your envelope to be). If your printed photo isn't visible through the paper, you can do the tracing against a window or use a light box if you have one. Because procrastination is something I excel at, I made a little animation about the envelope design process. Hopefully it clarifies the following steps a bit, even though it's probably more cute than informative. Here are the still illustrations I used for the animation. They're much more practical for tutorial purposes. 5. Draw flaps inside your rectangle. 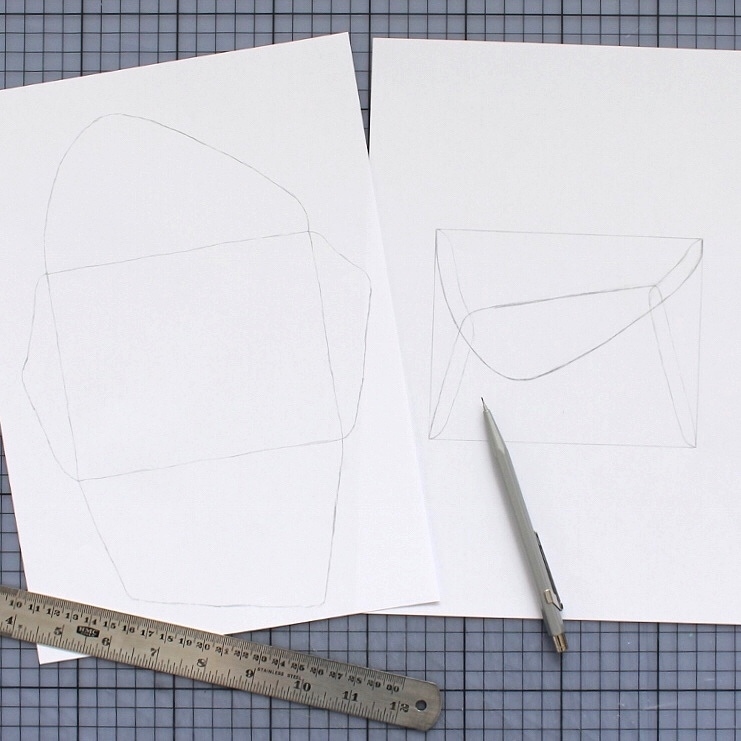 Decide the shape of the top flap first and draw it (forget symmetry! you can freestyle here!) Draw the opposite flap so that there's an overlap with the top one. I simply eyeballed the overlap, but if you want exact measurements, go with a ½" overlap. 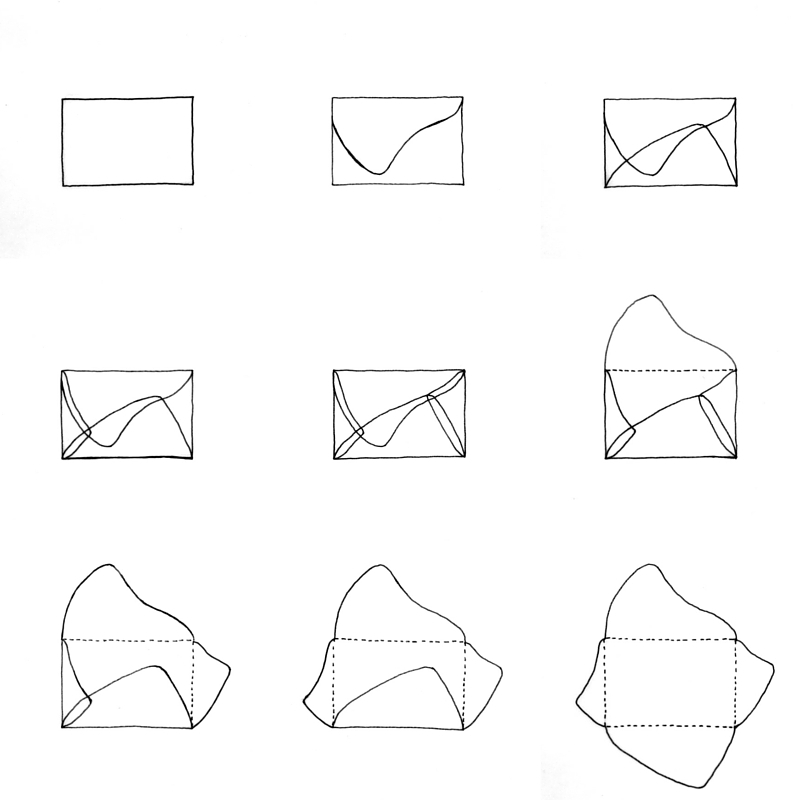 Draw side flaps - remember the overlap, again! Round all flap corners if you want. You'll end up with a drawing of a rectangle with lots of overlapping lines inside it. Don't panic. We're going to make it work. 6. Take another sheet of paper and trace the same rectangle on it you did before. Now flip it so that your new rectangle sits against the top edge of your old one (top edges butting against each other, that is). Trace the top flap. It's now where it should be, outside your new rectangle. Flip the paper so that the bottom edges of the rectangles are butted against each other and trace the bottom flap. Repeat with the right and left flaps, making sure they go the right way round! You should now have a drawing of a rectangle with four flaps around it. 7. Cut out the template and fold the flaps towards the center. Is it awesome? Yeah? Move along to the next step. If the mock up is more meh than awesome, figure our what needs changing and draw another template using the cut-out as a base. It'll be worth it getting it right at this stage, I promise! 8. If you're using smaller bits of paper, like book pages, for your envelope, determine how you're going to tile those pieces in order to create a large enough sheet. You can use glue to stick the bits together at this stage, but I use butted seams, or a teeny-tiny overlap, when I'm fusing this layer in step 13. At this stage we just plan the layout of all the bits and pieces. You can go a lot more complicated than my two spreads of book pages, but begin with something on the simple side. 9. Time to cut the fusible adhesive. Flip your template around so the lines you drew face the adhesive (not the carrier paper it's stuck on) and draw loosely around the template with a generous allowance (depending on your general accuracy level, something around 1/4-1" extra on all sides). You could also do this the other way round - not flipping the template, tracing on the paper side of the adhesive - but my adhesive material was a bit too slippery to handle that way round. Whichever way you decide to use, after you've traced generously around the template, cut the adhesive along that line. 10. Place your template on the table drawn lines facing up. 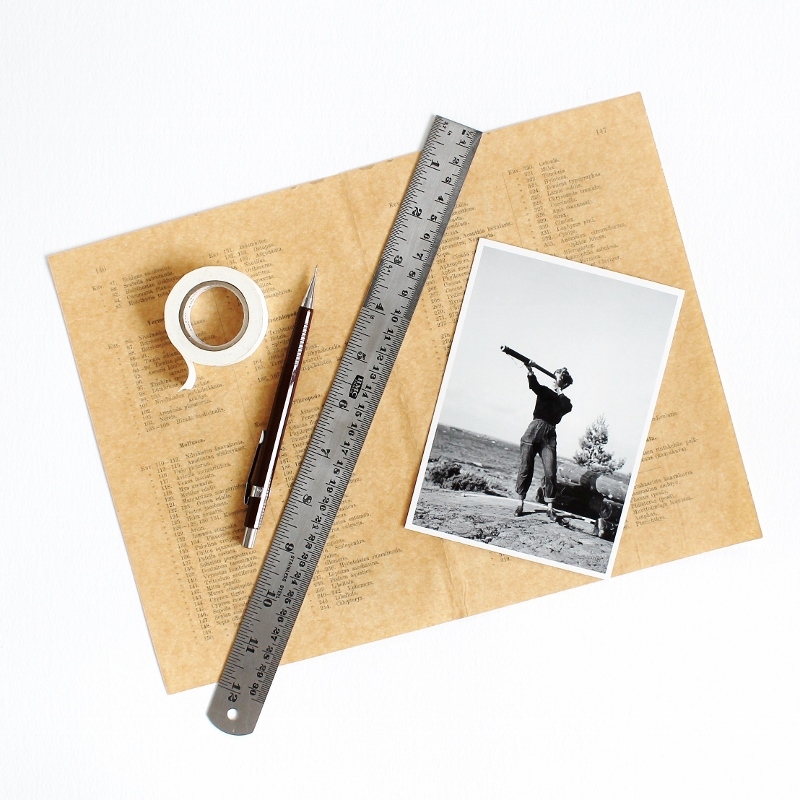 Top it with your printed vellum paper, photo face down, matching the photo with the rectangle on your template. 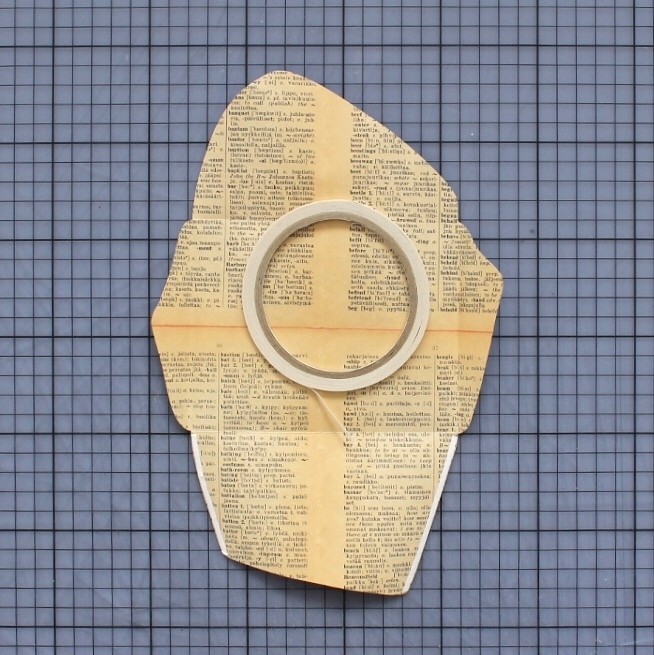 Place your fusible adhesive topmost, rough glue side facing the vellum paper, carrier paper facing up. Make sure there's some extra adhesive extending beyond the template on all sides. Use a bit of tape to secure the adhesive sheet in place. You can now set your template aside for a while. 11. 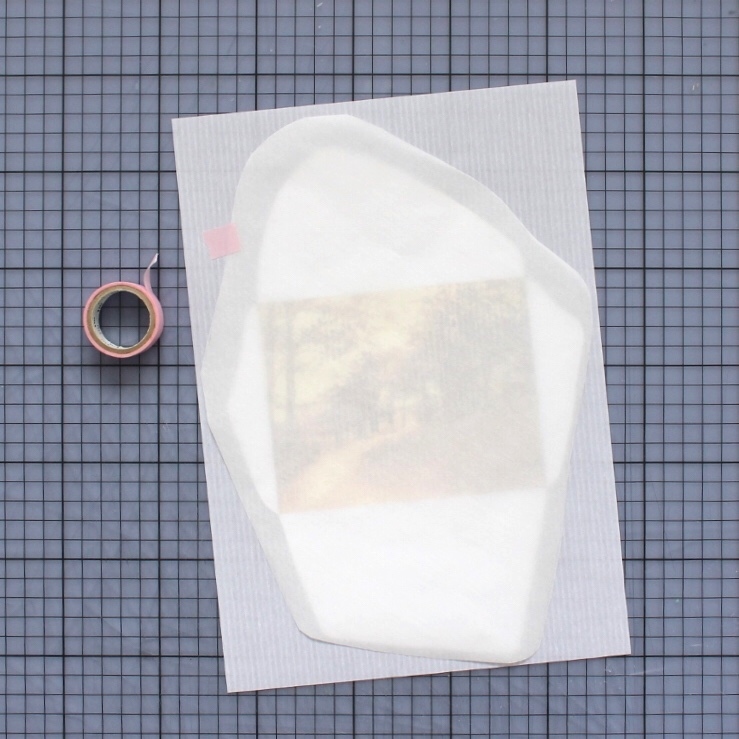 Sandwich your vellum paper + fusible adhesive with sheets of non-stick parchment paper so you won't get any adhesive onto your iron (or anything you may have on the bottom of your iron onto your envelope). Iron according to the instructions that come with the fusible adhesive you're using. Safe is always better than sorry. 12. Let your project cool off a bit. 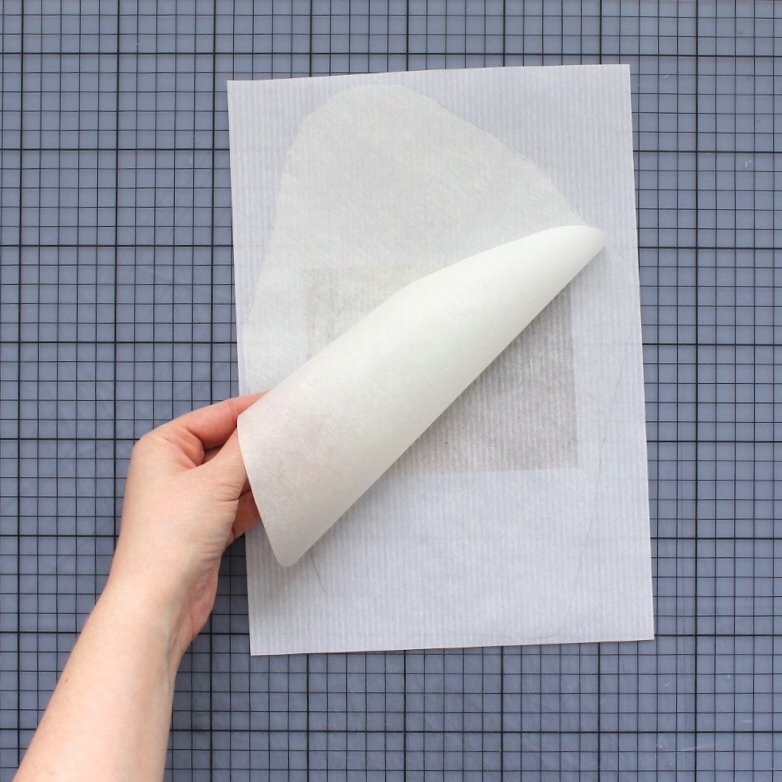 Peel off the carrier paper of your fusible adhesive. 13. 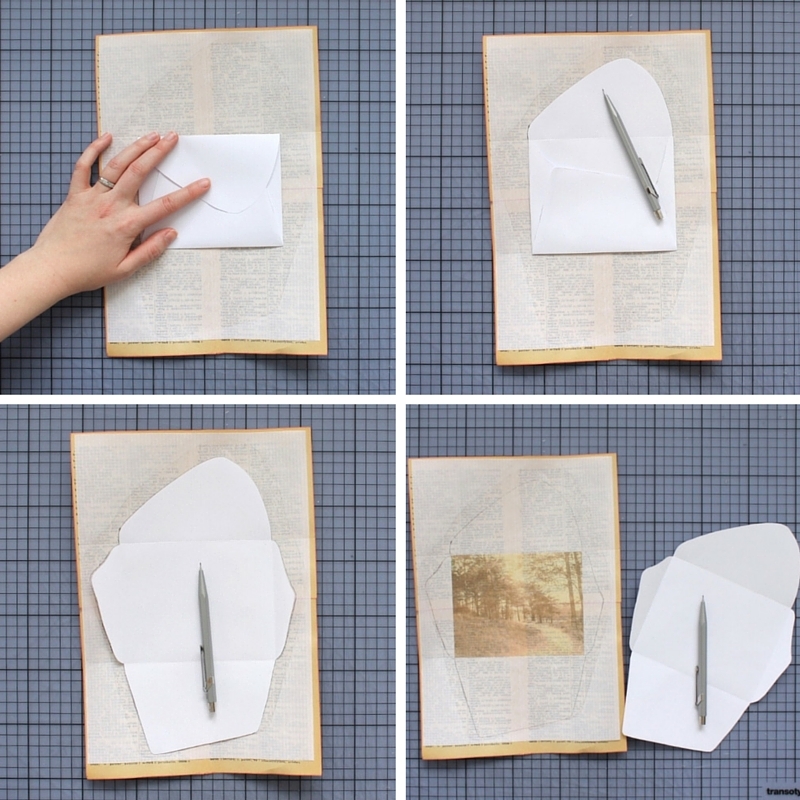 Adhering the book pages/paper you chose for lining your envelope. This step is one of those "do as I say, not as I do" steps. Taking photos at my ironing board was simply too impractical. 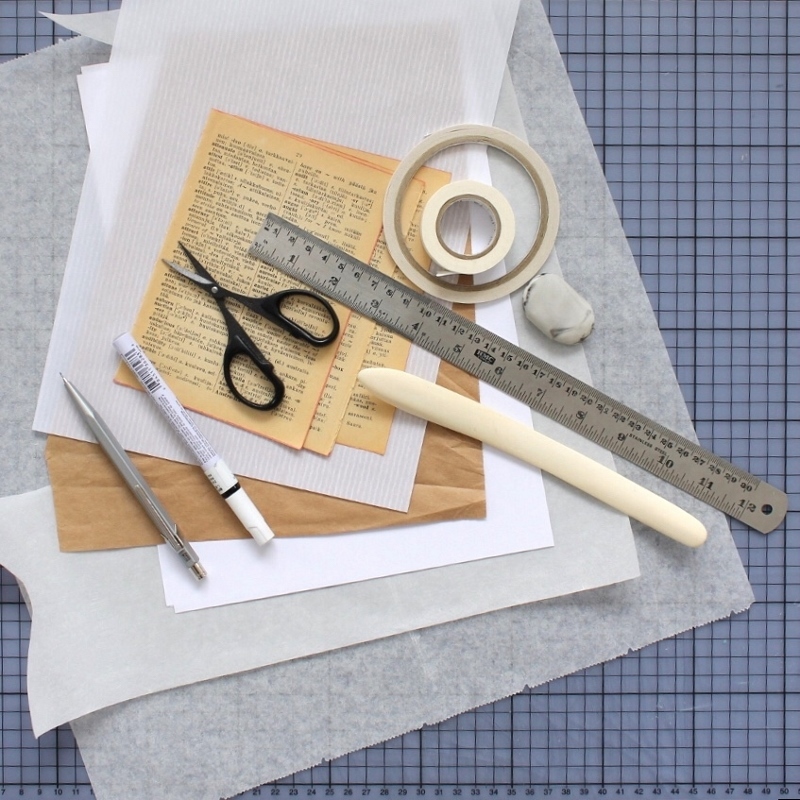 On your ironing board, place the vellum paper adhesive facing up. Cover with tiled pieces of paper (use butted seams or just a teeny-tiny overlap between pieces) or with a single larger sheet. 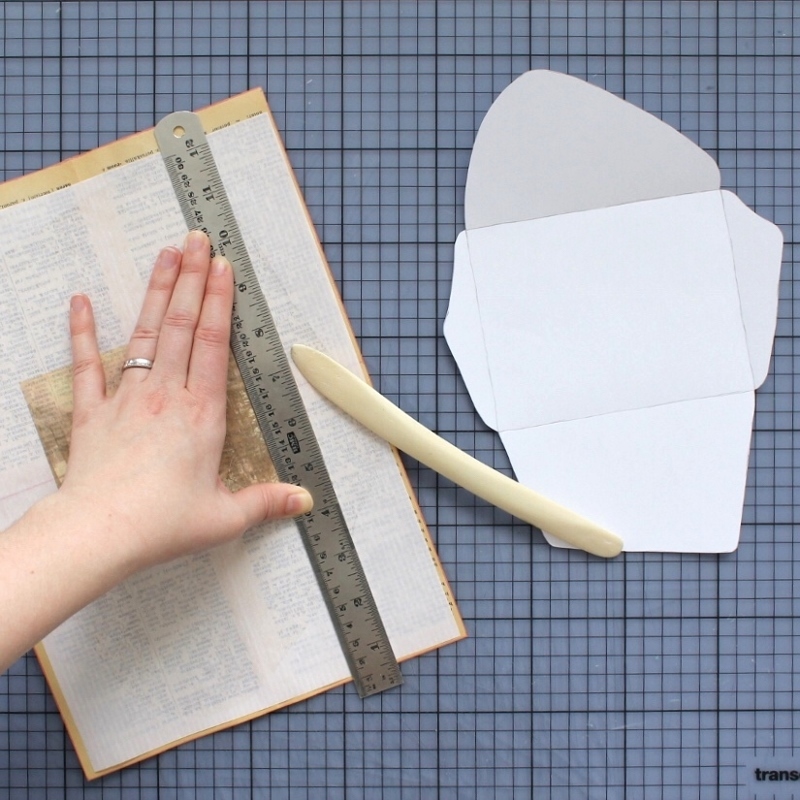 Remember that the side that faces adhesive will slightly show through the vellum paper and the side that faces up will form the lining of your envelope. Top with non-stick parchment paper and iron according to instructions as before. Your paper sandwich may want to curl a bit. If it's very curly, you can gently roll it in the opposite direction until it stays flatter. 14. Place your paper sandwich down photo facing up. Fold in all the flaps of your template - the pencil lines of your rectangle stay on the outside. Match this folded template with the outlines of your photo. 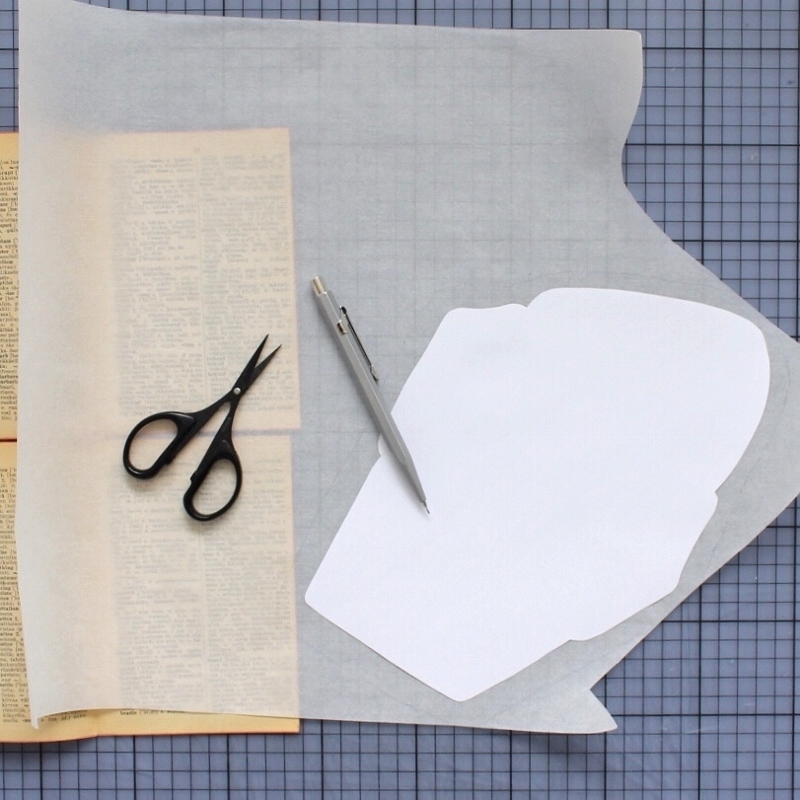 Carefully open the flaps, one by one, and trace the outline of the template onto the vellum paper. 15. Use a ruler and a bone folder to score fold lines along the edges of your photo (if you're not using a photo, then score along the fold lines of your template after you've cut out your envelope). If you don't have bone folder, you can use a very blunt knife (no cutting, just scoring!). 16. Carefully cut out your envelope. Quite satisfying, isn't it? If there are pencil marks visible, erase them. 17. Fold in the flaps. Press the bone folder gently over the folds to make the folds crisper. 19. Stick double sided adhesive tape on your bottom flap where it meets the side flaps. Use small bits one after another if you have very curved lines. Fold in the side flaps. Peel off the tape backing (if your tape has one) and stick the bottom flap down. You could also use glue to assemble the envelope, but here I was much too impatient to wait for it to dry. 20. Admire your handiwork. Fill the envelope. Close with a bit of washi tape, or however you desire. If your envelope is going to travel via postal service, I recommend using double sided adhesive tape along the whole top flap edge before adding any decorative closures. You can view the envelope animation in video format (with music!) on Instagram and tag your friends who might enjoy this project! PPS. 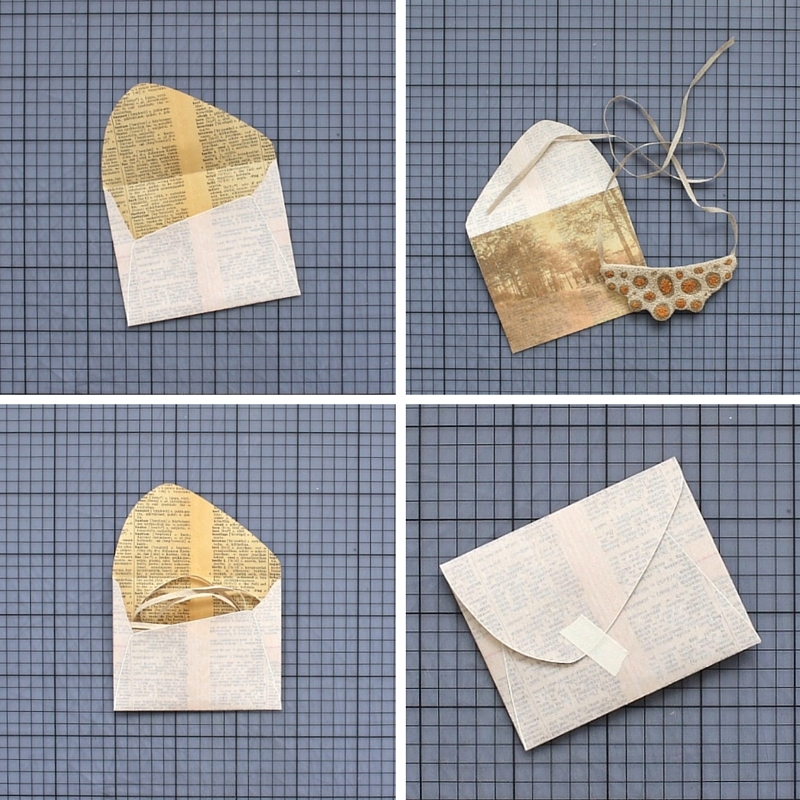 See my new tutorial for super simple folded envelopes! Here's my version of a non-linear notebook. I've covered the box with old dictionary pages and illustrations and used old scrap cardboard for the notecards. There are tabs for bookbinding, things to do, misc. crafts, jewellery, home, uni, poetry and this blog. For now the vast majority of the cards are blank but I can already see it in my mind's eye how this will look once I get things properly rolling. I made V his own copy and took step by step photos to accompany a tutorial for you. I hope you like it! Let me know what you think! This tutorial requires some basic knowledge of cutting and gluing things at a straight angle. Not every single step is explained in minute detail, so do read through the entire tutorial before embarking on your project. If you have questions, ask me and I'll do my very best to get back to you. 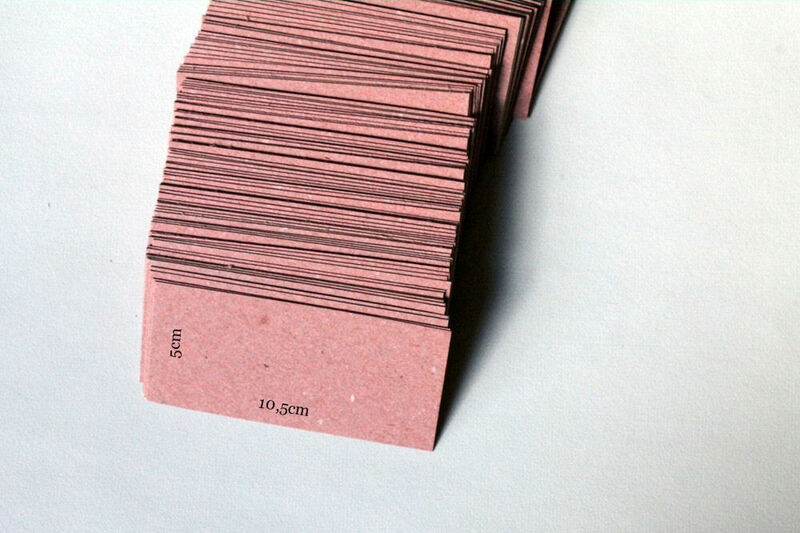 Begin by deciding what size you want your notecards to be and cut a massive stack of cards. My cards measure 10,5x5cm and I will provide measurements for a box that matches these but also a formula you can use for figuring out the correct measurements for some other size box. Glue the box elements together pairing them as described above. All parts have two pieces of board sandwiched together. You'll end up with two lid/bottom pieces that have the smaller piece precisely centred upon the larger one, four short side pieces and four long side pieces where one (long) side is glued flush and the rest have an even rim of a board's thickness. Let the pieces dry under a weight. Click on the photos above and below to see them larger. Once your pieces are dry lay them out as shown above and maybe do a test assembly with masking tape if you're unsure of what goes where. Glue the parts together so that you'll end up with two identical shallow boxes. Let dry, properly, for real. Sanding wet glue in the next step is a bad idea. Wrap a piece of sandpaper around a block of wood and sand the outer edges and corners of the box so that they're nice and smooth and perhaps even a bit rounded. Leave alone the edges that will face each other. If they're really uneven, then sand away but a rounded look is not what we're aiming for there. Cover the outsides of both box halves apart from the sides where the hinge will be. Leave small flaps at that edge. You can freestyle this covering process or see above photos for my way of doing it. Cut two pieces of fabric the same width as your box - one of them about 3cm over the height of the finished box and the other only 0,5cm over the height of the finished box. Glue the smaller piece of fabric flush with the exposed back edge of one of your box halves and glue down the flaps of your cover material. Place the halves together so that the hinge flap lies doubled over between them. Fold the larger piece in half to mark the center and place it over the hinge area. Cut the fabric into shape (see photo) and glue one half down. Whilst holding the halves firmly in position glue down the other half making sure that the hinge are is well adhered.Let dry for a while. Close the box and cut the remaining back hinge fabric flush with the top edge of the box. Glue the fabric and the remaining flaps of cover material in place. Cover the exposed back hinge with two strips of paper leaving a tiny gap between them where the hinge is. This is to prevent the paper from buckling and creasing and the hinge area from bulging when the box is opened. At this stage, give the box a nice coating of lacquer and attach the box clasp if you're in the mood for one or the other. You'll be fine without a clasp too. The full width fabric hinge is sturdy enough to keep the top and bottom halves straight. Cut your lining material into two long strips (with some extra width) and two squares that will cover the insides of the box. Fold the strips into shape by moulding them into place with your fingers (I left a little bit of the top inside edge showing but it's fine to go flush with the edge too). Cut triangles out of the corner areas to avoid excess material bulging. Glue the strips into place one side at a time. Check the size of your fabric squares and glue them in place. Let dry. Craft yourself some tab cards and name them according to your needs. Enjoy your newly finished non-linear notebook and put it to good use! Let me know what you think! If you have any questions or comments, please share. Please note that this tutorial is for personal use only. 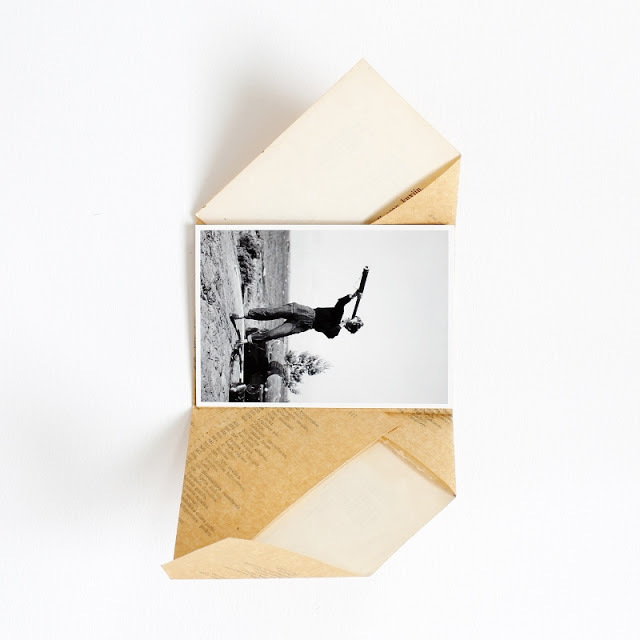 You are allowed to use this tutorial to make box notebooks for yourself and for strictly non-commercial purposes. However you're not allowed to sell items based on this tutorial or to reproduce or sell this tutorial.